"Unstable [unpredictable & diverse] as water, thou shalt not excel; because thou wentest up to thy father's bed; then defiledst thou it: he went up to my couch." These also describe the water sign of Cancer, astrologically. Reuben occupies land of ancient Gaul - who were Celtic. Reuben was to lose his birthright status to Joseph [England]. Brittany, as Celtic Reuben, along with France, loses out to England as destiny is written. Who transforms as ice to steam? Reuben. Who holds fast and then lets go without reason? Reuben. Who appears old, but yet is new? Reuben. Who is today here and tomorrow gone? Reuben. If we were speaking astrologically, we would be describing the unstable water sign of Cancer. Reuben once occupied the northern section of land that was ancient Gaul, in modern identification purposes, Reuben more specifically pertains to the Celtic peoples of France and especially Britanny. The name 'Gaul' refers to the ancient Celtic people who spoke a language known as Gaulish or Gallic. Reuben [France] was to lose his birthright status to Joseph [England]. Brittany, is where Reuben resides in more modern times, which loses out in power and strength to Joseph/England, as their destiny is so written. Reuben's identifying symbol was the Mandrake. Reuben's interest was gathering a plant called mandrakes, of which he would gather for his mother, Leah, who used the mandrakes as a bartering item with her sister, Rachel. The plant may have had a narcotic effect, such as marajana, and perhaps Rachel had become addicted to them, for she traded her husband for the night for some of Reuben's mandrakes. The French Fleur de Lis symbolically replaces Reuben's mandrakes. 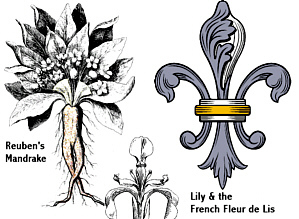 France, including the province of Brittany, uses the fleur de lis as a logo. This symbol is a stylized design that resembles either an iris or a lily, and most likely the water lily or lotus, which was a ceremonial item in ancient Egypt. 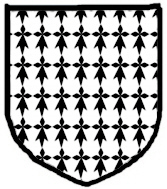 This symbol is commonly used in heraldry in many Israelite nations, but not as predominantly as it is in France. The recent discovery of psychedelic properties in the blue lotus [water lily] was probably known to the Egyptians and explains its role in ceremonial events. Unpredictable and diverse is Reuben: 'France is known around the world as a very diverse country, of its people, architecture, and landscapes. About 50% of the French population claim to have a foreign background, which makes France one of the most diverse countries in the world. “And Leah conceived, and bares a son, and she called his name Reuben: for she said, surely the Lord hath looked upon my affliction; now therefore my husband will love me.” Therefore the name Reuben means 'behold a son'. Leah was hoping that by presenting Reuben to Jacob, she would overcome her husband's preference for his second wife, her younger sister, Rachel. “And it came to pass, when Israel [Jacob] dwelt in that land, that Reuben went and laid with Bilhah his father's concubine: and Israel heard about it”. Reuben was the firstborn, albeit he defiled his father's bed by sleeping with Jacob's handmaiden wife, his rightful birthright was given to the sons of Joseph, Ephraim & Manasseh, therefore, the firstborn son of Jacob became Ephraim. So in this case, Reuben saved the life of his brother, Joseph, which should have redeemed his bad karma for sleeping with his father's chambermaid. Brittany occupies a large peninsula in the northwest of France, lying between the English Channel to the north and the Bay of Biscay to the south. Some people in Brittany complain about the current division of Brittany and would like to see Loire-Atlantique joining the region of Bretagne [modern name for Brittany] to reunify the original boundaries of Brittany. The immigrant Britons gave this region in northern France its current name and contributed to the Breton language, Brezhoneg, a sister language to Welsh and Cornish. The French speaking peoples surrounding the region, gave the name 'Bretagne' to the area where Britons [Celtic] settled while fleeing the Anglo-Saxon invasion of Britannia, hence they gave the name 'Grande Bretagne' [Great Britain] to the island of the Britons. ‘Grand Brit’ in Hebrew means ‘grand covenant’. Brittany is also famous for its megalithic monuments, which are scattered over the peninsula; the largest alignments are near Carnac. The purpose of these monuments is still unknown, and many local people are reluctant to entertain speculation on the subject, however, we know – don’t we? They are the ‘stone heaps’ that were set up by the Israelites. The Druids once knew their importance, but of course Christian destroyers made sure the Druids were exterminated and forgotten. The words dolmen - from the words 'daol', meaning table, and 'maen' meaning stone = stone table; and 'menhir' means high stone. These words come from the Breton language, even though they are hardly ever used in Breton. The Bible records instruction to the Israelites to lay up stones along the way to be used as waymarks. Reuben's sinful conduct brought down upon him his dying father's malediction. Although Reuben was a part of the initial plot to kill and later enslave their brother, Joseph, it was Reuben who advises the others not to kill Joseph, and later points out that their troubles in Egypt were the consequence of the plot. Later he offers his own two sons as surety for the safety of Benjamin to hopefully end the famine, an offer Jacob refuses. After Jacob and his family went down into Egypt, no further mention is made of Reuben beyond what is recorded in Genesis, chapter 49. He was probably the wisest and most compassionate of the brothers, but a bit unlucky. As firstborn, Reuben should have been the leader of his brothers, therefore taking responsibility for their collective actions, which he attempts to do with Joseph and Benjamin, but not completely effective enough to suit his father. Reuben's rights as 'first-born' were forever transferred to the children of Joseph.